Research presented at the American Psychological Association suggests that a messy desk is a sign of creativity, and doesn’t necessarily impact productivity. On the other hand, for some, messiness on the outside is representative of what’s going on on the inside. The truth is organization isn’t about neat piles and a label for everything. It’s about setting up your office in a way that allows for productivity and doesn’t hinder work, whether that means a messy or clean desk. Here are five tips for organizing your home office to maximize productivity. Note that you don’t have to avoid clutter completely. Messiness can actually be stimulating for some workers. At the same time, you want some organization to the clutter to avoid wasting time looking for the materials you need. If you are oriented towards clutter, find a way to make it work for you. For example, have paper piles with a purpose. Instead of multiple piles of various items, have one pile for bills, another for invoices, and another for reading, etc. They’re still piled and a bit messy, but now you at least know which pile to start with if you’re looking for a specific type of paper. If clutter impacts your energy and productivity, you’ll need to do more to create a clean looking space. If paper is getting in the way, switch over to paperless systems for filing. Keep a file sorter at or near your desk to get paper out of the way quickly, even if you can’t file it officially. While paper is a big source of clutter, it’s not the only one. Pens, paperclips, thumb drives, books, calculator and more can take up space in your work area. Once a week or so, cull these items (i.e. get rid of dried-out pens) and put them in a place you can easily access them. Use containers such as pen cups and paperclip holders to contain items. Note that clutter doesn't just crowd your desk, but can create chaos in other areas of the office if allow it. Other places to manage clutter include bookcases, items hanging on the wall, chairs, and the floor. Searching for work materials or having to get up to get something wastes time. If there’s something you need to use frequently, keep it within reaching distance to where you work. This may include a phone, reference books, planner, files, mailing supplies, printer, etc. If you have many items you need frequent access to, you might need a bigger desk. Or you can have a desk layout, such as a U-shaped set up with a desk or a desk and tables so you simply need to swivel around to get what you need. Nothing can negatively impact productivity more than discomfort. If your back hurts or you have eye strain, you won’t want to work. A quality chair and well-lit office are crucial to your comfort and health. Ideally, your office should have natural light, but also adequate artificial light to avoid eye strain when it’s dark out. Adjust your chair or computer monitor so you’re looking straight ahead, not up or down, to avoid neck and back issues. Because sitting so long can be detrimental to your health, consider getting a standing desk, or an adjustable shelf for your monitor so you can sit or stand. Routines become habits that allow you to move through actions without having to put a lot of thought into it. Schedules ensure you’re getting things done on time. These time management strategies help with focus and productivity. For example, I work through the same items in the same order first thing in a morning routine. I don’t have to think about it, I just do them. The problem with routines and schedules is that they can become ruts and stifle creativity. When your routine and schedule start to make you feel sluggish or uninspired, change them up. You’ve left a drab cubicle to run your own home business, giving you the opportunity to set up your home office the way that works best for you. Now there are no rules about whether or not you can have personal pictures or a plant on your desk. In fact, you can maximize your energy and productivity by decorating your office in a way that brings you joy or inspiration. Consider painting your office in a color you like. Hang pictures or posters that inspire or motivate you. 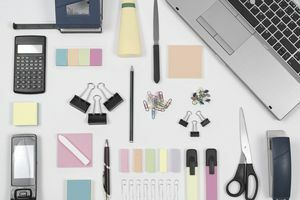 Use decorative office tools and supplies, such as colorful files. Surround yourself with items that inspire you. If you like the beach, have a shelf with a beach setting that includes a mini-palm tree, a coconut cup, and shells. Productivity and motivation don't just have to come from sheer will. You can encourage and inspire it through your surroundings. To maximize your home business success, purposefully organize and decorate your office in a way that helps you be your best.